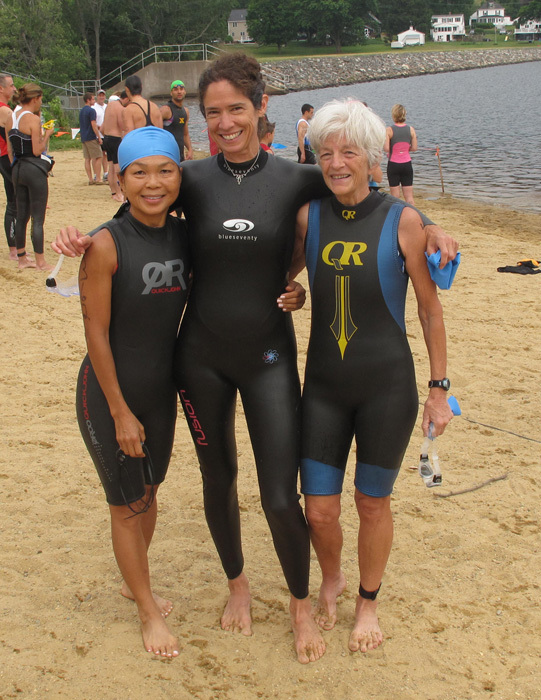 July 14, 2012 Amesbury, MA Sprint Dam Triathlon: 1/2 mile swim, 12.3 mile bike, 3.2 mile run. Great experience and I’m so happy to have trained well, pushed hard and had wonderful people supporting me! Here are some pictures from the day along with my final results! Here I am with a couple of my regular work colleague training partners, and these women rock it! Our swim wave was soon to begin and groups of swimmers went out every 3 minutes. 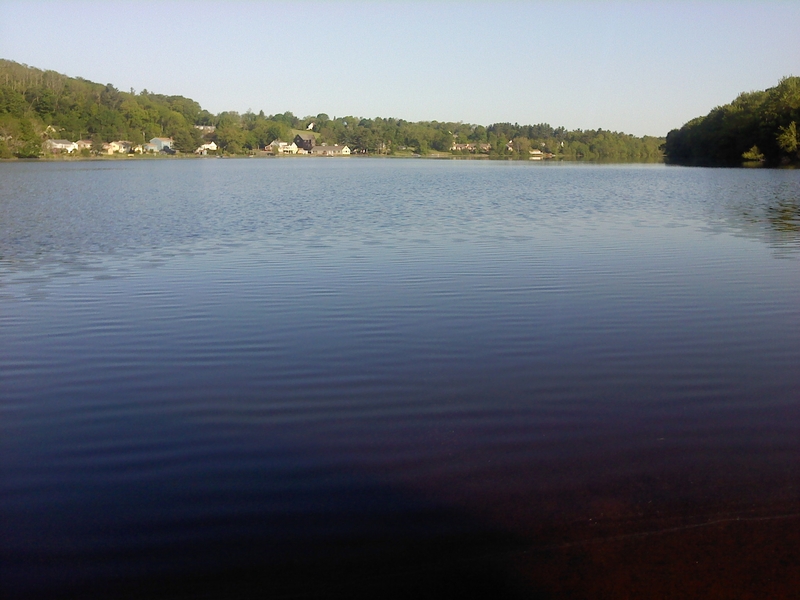 This is the lake where the swim was to take place. Notice the orange buoys in the top corners – this shows the ½ mile swim course: swam out to the right one, then turn left to the other one and then back to shore = 1/2 mile swim. Here is the beginning of my swim wave (and there I am at the top out in front, as I got into the competitive spirit of the moment). Well apparently this was a classic “newbie” mistake, not only to start out too fast but to start out in the middle of the pack. I got out there about 100 yards or so and found I needed to catch my breath by doing a bit of doggie paddle while thinking to myself, “what did you do? You didn’t do this in practice swims!” But soon enough I was able to catch my breath and got into a regular crawl and did fine the rest of the way. Feedback I received after the event: hang off to the side of your swim wave, not the middle, and keep a consistent pace. 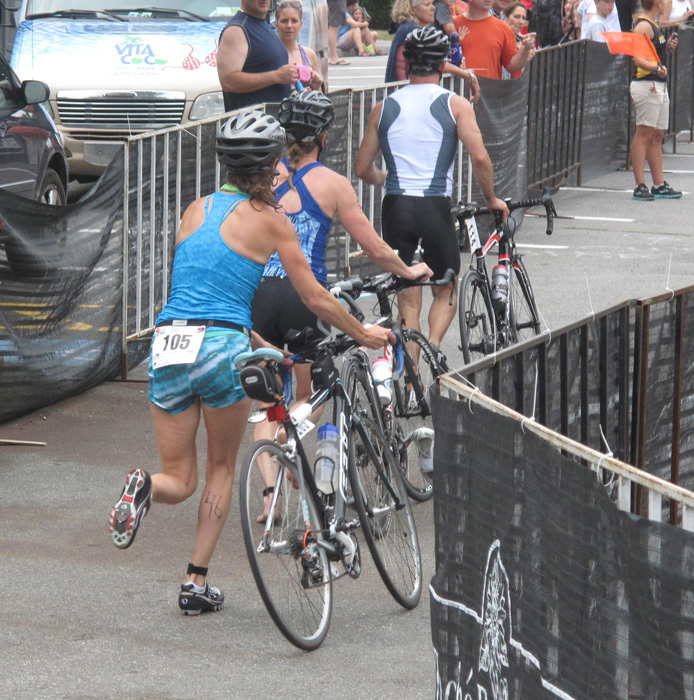 Swim is done, now there I go – running out of the transition area with the bike to begin the 12.3 mile bike course. Everything was wet from the swim but that helped to keep me cool and keep the transition time less. 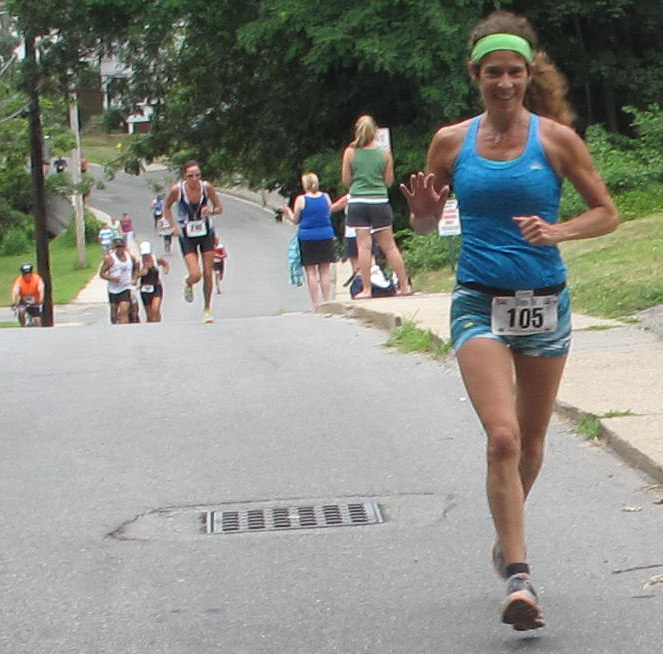 Here I am completing the 5K run portion at the end (after completing the 12.3 mile bike course) and this was at the last hill, just a short corner until the finish line! 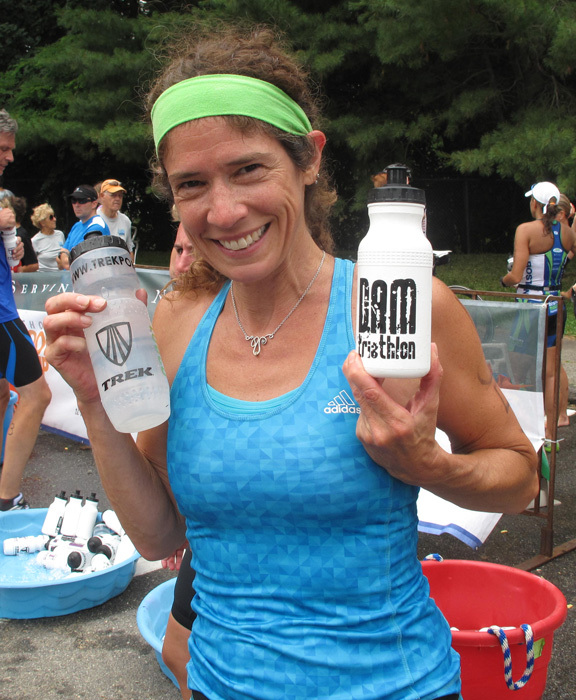 At the race completion – I got my DAM triathlon water bottle! And here I am with my bike – what a great investment this has been; rides like a charm! This picture was after the event was completed – my hair had gone from big to wet to now this partial big, LOL. So fun! 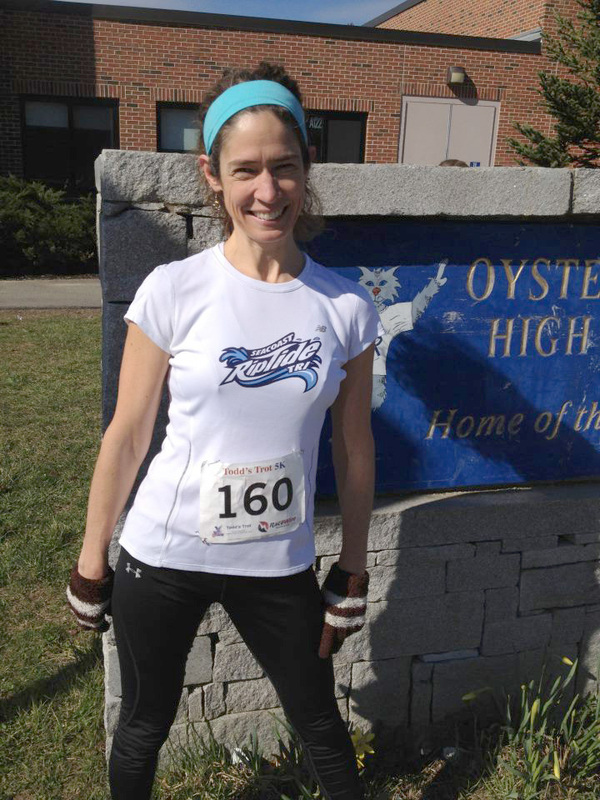 And a final pose – with my numbers (written in permanent ink at the beginning) – bib number 105 and age 46! 13.2 mile bike – 42:28 (with several hills!) works out to be a 17.38 MPH average even with the hills! A great overall first time experience, for sure!!!! I can now proudly say, I AM A TRIATHLETE!!! So it’s been a long while since I posted last – but nothing like now, especially since my first ever triathlon is TOMORROW! So here’s a rundown of things I’ve discovered since April, 3 months ago. Not only did I achieve my initial goal of completing at least one 5K road race, I’ve completed 6 races thus far in the past couple months! Two of them have been with my son. Me at a 5K finish! After realizing I was running 5Ks in the mid to low 25s I set a goal of getting below 25:00. I started to focus my running with a speed workout once a week (such as 8 x 400s in the 1:40s) along with tempo runs and long runs. I achieved my goal – not only below 25:00 but just shy of getting into the 23:00s with a time of 24:02! Speedwork once a week with a great group of friends is an important part of training! I’ve also learned what negative splits are (make the last ones faster than the first ones) and a watch that can track laps has been a good tool to have! Over the course of 5 months I’ve gone from only being able to run about 2 miles before having knee pain to now being able to run 8 miles with no pain! I credit this success to regular cross-training: gradual run sessions with regular swimming and biking, rest, and good nutrition (still meatless going on 9 months now). I have gradually added run time/distance at a rate of about 10% more per week. 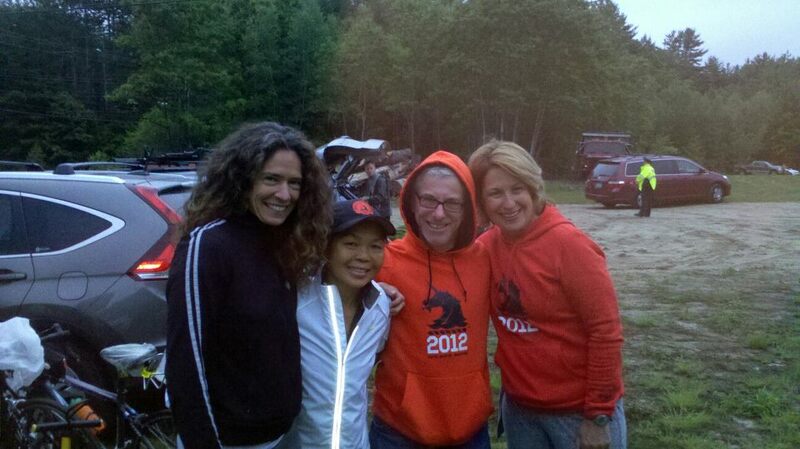 I did my first open water swimming in May – thanks to some wonderful friends. My friend Judy loaned me a wetsuit since I didn’t yet have one of my own. 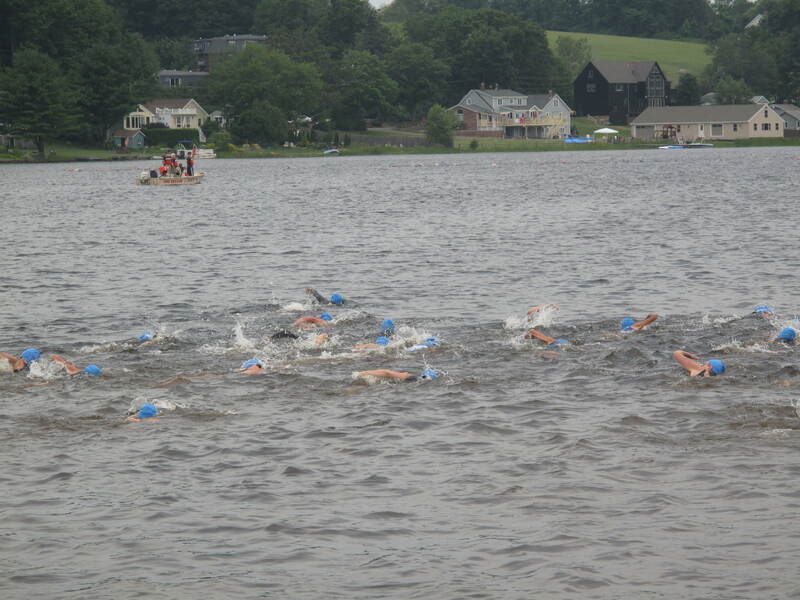 We swam in the same lake where my triathlon will be held. It looked a bit intimidating at first. Once we were in the middle of the lake I realized what an inspiring experience this was. Here I am looking like a seal, swimming outside with the sun in view each time I turned to take a fresh breath, and I was with friends with the same goals. 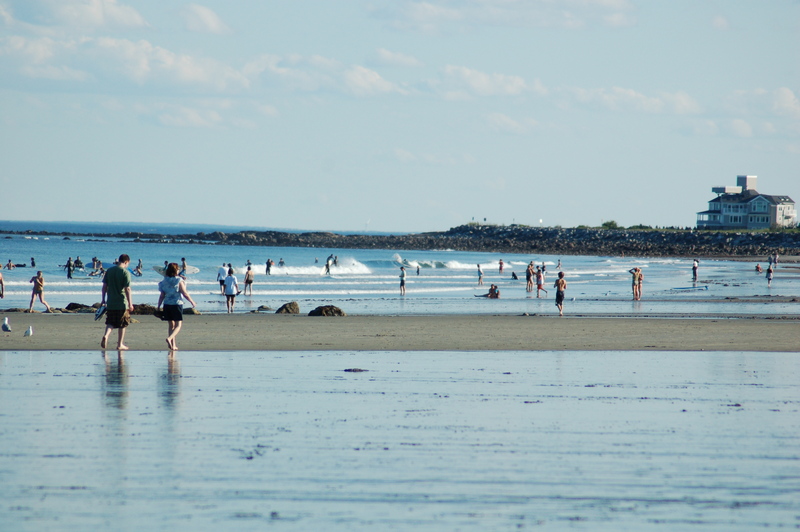 We swam out to the marker in the middle and then back – – just under 1 mile! Friends make it all great! 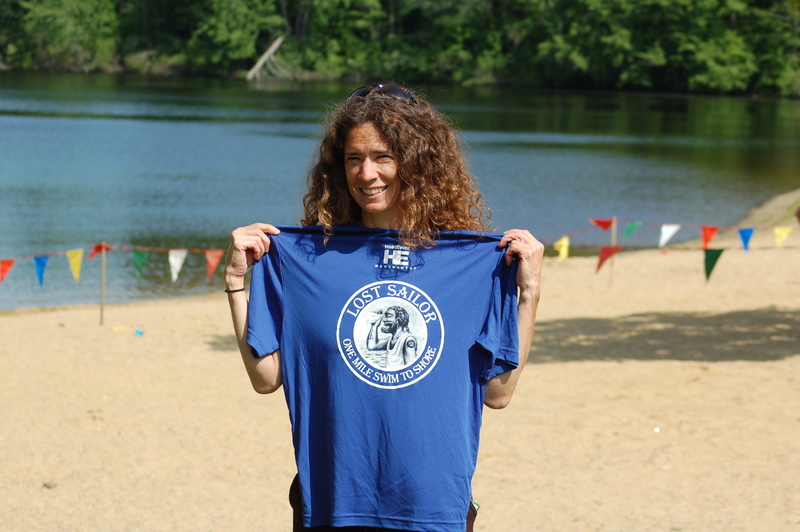 After a couple open water swims I realized that, yes, I could sign up for the Lost Sailor 1 Mile Swim event at the end of May – in the same lake. It was a great day and not only did I complete this event with a time of 31 minutes, I got to experience the group swimming and it wasn’t so bad! The pink cap is now a regular – it’s bright and easy to fit over all my hair! The goggles (Aqua Sphere) keep the water out and don’t leave goggle marks on my face! So happy I completed this! 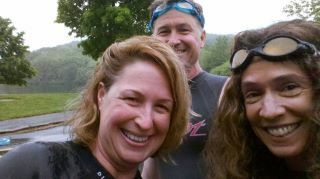 I went to see my two friends compete in their own triathlon at the beginning of June. While it was a downpour the whole time it was good for me to see a triathlon in action for the first time, especially the transition area. Homemade smoothies with greens mixed are a great recovery meal/beverage post-workout. They pack incredible nutrition that your muscles will just soak up. You really don’t even notice the greens are in the drink. I make mine with a couple handfuls of fresh kale, along with a tablespoon of chia seeds, frozen blueberries and either plain yogurt or soy milk. What a great way to get taste, nutrition, healthful phytochemicals, carbs and protein to fuel for the next workout. 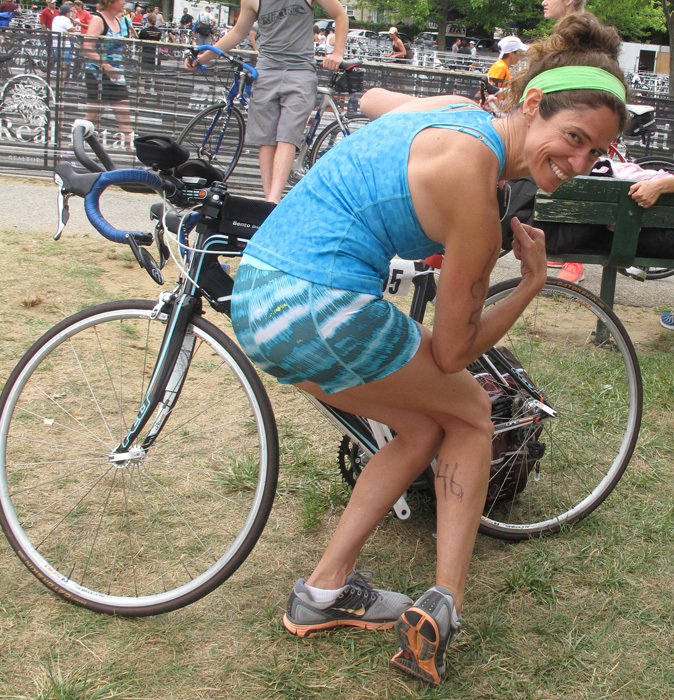 Joining a triathlon club has been helpful! I have met some great like-minded people to train with and learn from. 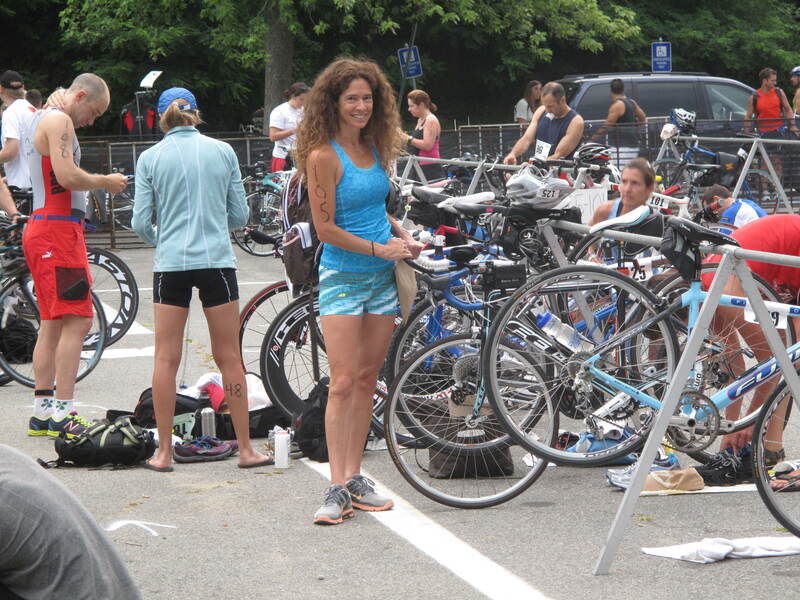 I’ve been able to go to seminars, run clinics and several newbie triathlon clinics. One of my favorite ones was the transitions clinic. Actual practice of T1 (swim to bike) and T2 (bike to run) is a great idea – it’s one thing to think about it, it’s another to do it. My first ever brick workout: my friend Dan and I biked the triathlon 12 mile course and then ran the 5K course. I had heard that the legs from bike to run is something to experience during training. Wow, my quads felt so heavy for the first 1/2 mile or so but then leveled out. It was good to experience that and have that training opportunity. I’ve tried some other mini-brick workouts: such as 3 sets of 15 minute bike to 8 minute run. I got to practice speed on transitions and also have my legs get mini training sessions for leg work transitions. I found that the heavy legs lasted about 2 minutes before the feeling leveled off and I felt better. Good to know! I’ve learned too that tapering is an important part of training, meaning that I need to back off workouts just before the big day. So that’s what I’ve done yesterday and today – no workouts. Feels a bit weird to not do a workout but the big day is TOMORROW! So the day has come to put it all into action while having a fun time doing it. I embrace living with a grateful heart! 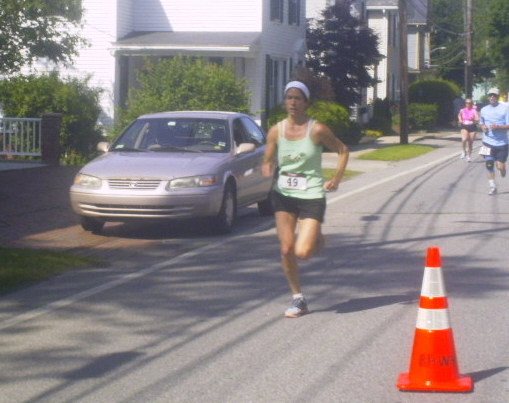 MY FIRST EVER 5K (3.2 miles) on April 7, 2012 in Durham, New Hampshire! It was fun on this bright and crisp morning and I was pleased with what I did. My time was 25:22 and my average pace per mile was 8:09. I was actually surprised when I got to the first mile mark and the times were called out; the guy shouted, “8” (minutes) and I was surprised! 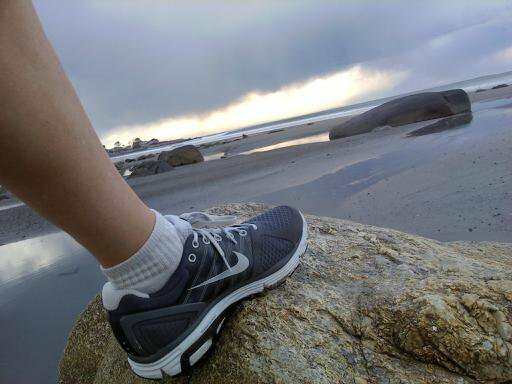 In training I have been running at more of a slower pace so I knew now I was running faster than usual. By mile two, they called out “16:04” and I knew I was keeping to a similar pace despite a couple hills between. That was exciting! There were several hills added to the challenge of the course and overall, I felt that push and I kept going. Throughout it all my knees felt fine and I feel so proud I did it! The cross training since February that I’ve been doing has been a true benefit (indoor cycling twice per week and recently outdoor cycling, the swimming at least once per week and the gradual increase in LSD running (long, slow, distance). I also joined a track group at the college at the beginning of February, doing speed work drills each Wednesday (such as 4 x 800 meter sets or various ladder drill workouts). What a great group experience this has been! It’s great to have others to run with and challenge yourself, otherwise I don’t know if I’d do such drills on my own! We did most of our sessions on the indoor track and recently have taken them outdoors with the better weather. So with this 5K race accomplishment I’m excited to keep moving forward! 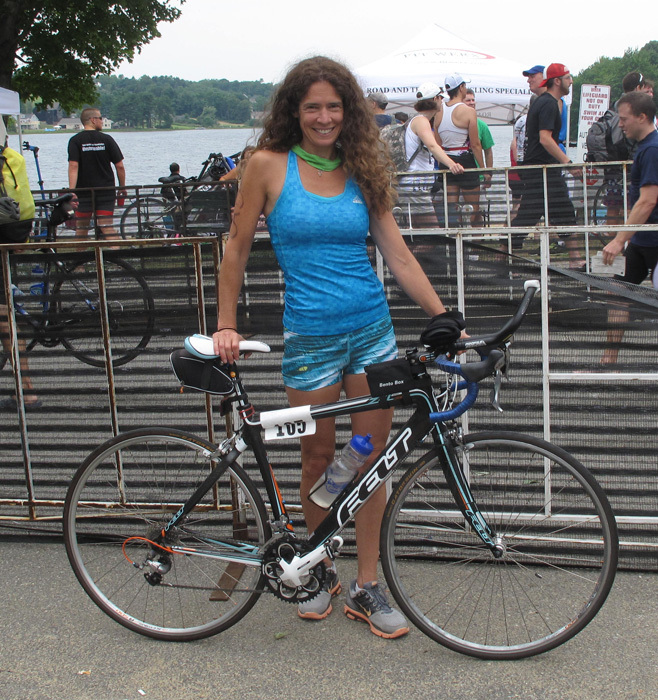 I have taken the next step for my goal of completing at least 1 sprint triathlon this year by officially signing up: Saturday July 14, 2012 at the DAM Tri in Amesbury, Massachusetts: 1/2 mile Swim, 12.3 mile bike, 3.2 mile Run. So I will keep training, keep eating well (still going strong being a vegetarian for 6 months now!) and keep moving forward. 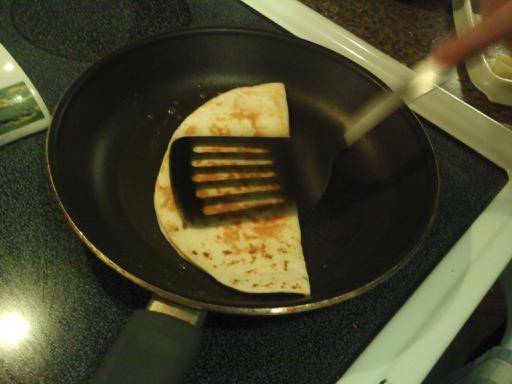 My son made my day today when, at the grocery store looking for quesadilla fixings together and after me saying, “why don’t you pick out a jar of salsa that you’d like” he says, “why don’t we just make our own pico de gallo instead?” Wow, what a great idea, and how awesome is it that he knew to think of that as an idea! I’ve been trying over the years to encourage him to be a part of making foods (one of his favorites has always been desserts) and at least showing him this by making various things from scratch for him to eat. For example, I found a recipe for a basic pancake mix that we now put together and leave in the freezer for later use. Much better than the box mixes that can also include hydrogenated oils (unhealthy trans fat), preservatives and a bunch of other ingredients. We’ve also discovered making a birthday cake (and the frosting) from scratch is far superior in flavor. 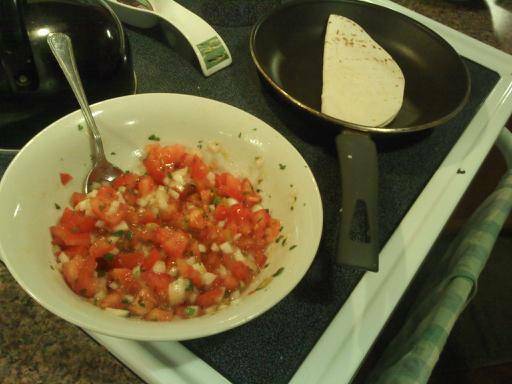 So I was delighted that he suggested we make our own pico de gallo salsa. It’s this dietitian-mom’s delight! So we got some tomatoes, fresh cilantro, some sweet onions and some sharp cheddar cheese. Once we got home I got him on the task of grating the block cheese while I cut up the tomatoes and onions. He pulled several sprigs of cilantro and washed them and then opened a can of diced green chilis that we had and drained them. Then we combined the tomatoes, onion, cilantro, sea salt, pepper, garlic powder, some chilis and a squeeze of half a lime and let that set a bit. 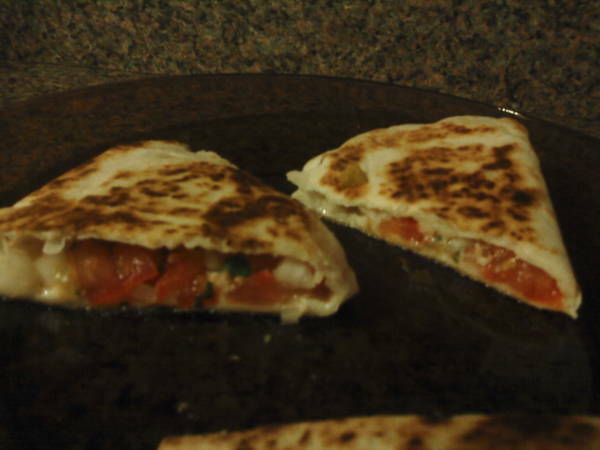 It was fun and quite easy to make these cheese and pico quesadillas, and the best part (in my opinion) besides the taste, was that they were so fresh-tasting with that crunch of fresh onions and the fresh cilantro. And beyond the fresh food – the ultimate best was that my teenage son was with me in the kitchen and we were spending this time together. This is wonderful. Swimming takes on a whole new light when you decide to train for a triathlon for the first time. 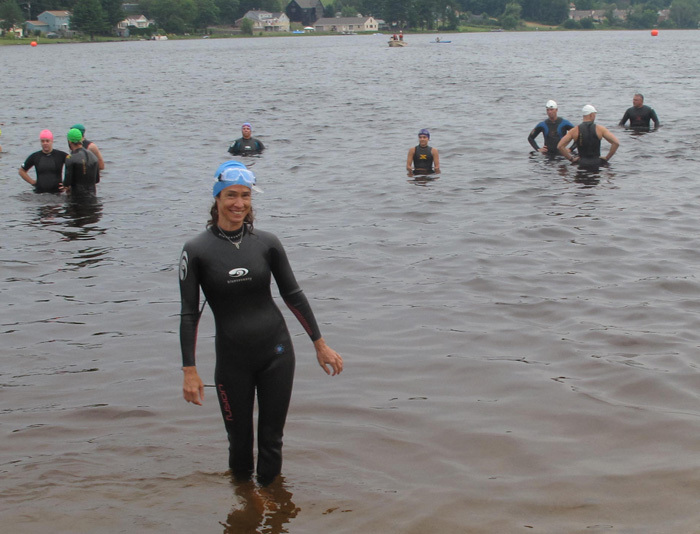 Sure, I know how to swim and have fun in the water; but open water swim for 1/3 or 1/4 mile? This is something I’ve challenged myself to get ready for and do (and eventually follow that with a 15 mile bike ride then a 5K run!) So with the winter still upon us I have made good use of a Master swim class (once per week for 8 weeks). This has been an eye-opening experience thus far. It’s one thing to be breathing hard during a workout in your own living room but with your face in the water it’s a whole different experience! As I keep learning through the swim sessions I find gratitude in many things: for goggles and a swim cap (keeps all this long, curly hair in check and adds boyancy!). I’m learning proper drills to help my body flow more efficiently in the water. Wow, what a workout this swimming is; and this is just the beginning. At this point I still can’t even imagine what it will be like to swim for 1/3 mile all at once – – but it sure will be sweet when I do accomplish it. 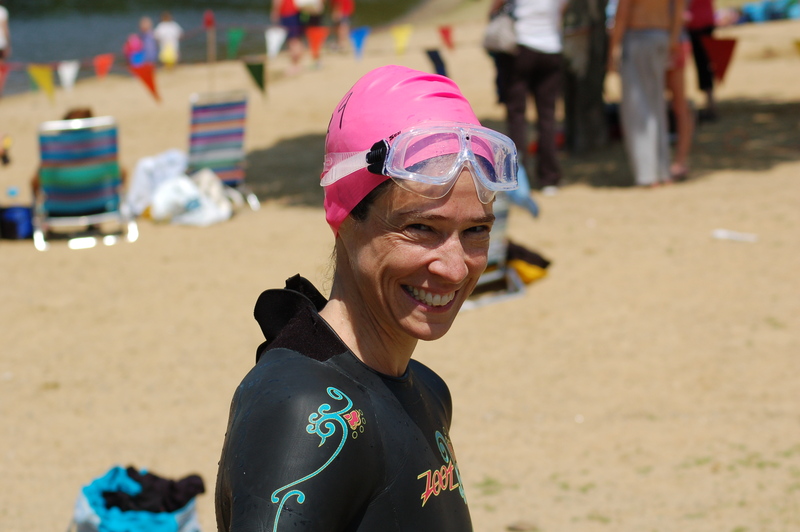 As soon as the weather allows I’ll try another new task: open water swim, and a wet suit. I love all these new things! 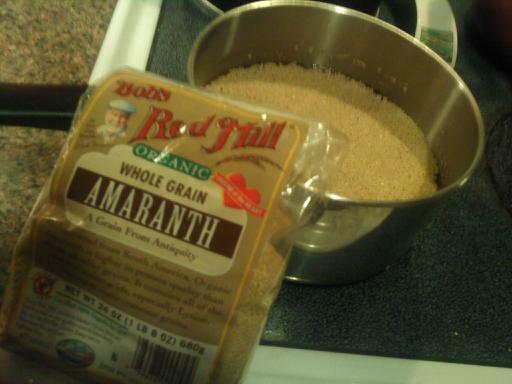 Last night I cooked up some amaranth grain so I could have it on hand ready to go for morning hot cereal. It’s easy to make: 1 part grain to 3 parts water and simmer about 20 minutes. This is a very nutritious whole grain, in fact, it contains all of the essential amino acids (often lacking in most plant-based foods). It’s a great source of fiber and provides 20% or your iron needs and 8% calcium. This is a great grain to include in any dish, whether it be hot cereal or added to soups and casseroles. With a carbohydrate to protein ratio of about 4:1 (32gm carb and 7gm protein per serving) it makes a nice addition to any athlete’s post workout meal – carbs for glycogen recovery, protein towards muscle repair and synthesis. Being a vegetarian athlete myself I’ve been especially focused on protein and whole foods quality and this is a great addition. This morning I re-heated a 1/2 cup portion and added some slivered almonds, dried cranberries and a bit of soy milk. It’s a hearty, tasty and nutritious meal; and since I cooked up some extra I’ll have more on hand through the week – ready to go. So it’s 2012 – I’ve decided for my goal this year it’s going to be to train for and complete at least 1 triathlon. I’ve done the biking before, I’ve done at least some jogging, I know how to swim . . . so why not? Well, I must say this triathlon idea kind of came out of left field for me. Yes, I’ve been pretty active (doing Insanity and other home based interval conditioning programs), completed the Couch to 5K training program last spring (highly recommended!) and completed 2 Warrior Dash races. But I’ve never done everything together in one event! Well I’m one to give myself a challenge to reach – and I love the physical ones. A couple years ago I decided to buy a road bike and get into that. I found a great group of folks locally (Gus Bike Shop) and weekly women’s group rides in the summer – I completed a 50 mile ride event and the next summer completed a 100 mile ride. So now the challenge – conditioning with swimming, group swimming, transitioning from one to the other in the same event and proper sport nutrition – vegetarian style. Since deciding to do this goal I’ve made some great connections – found a local triathlon club, met some like minded folks, signed up for some Master Swim classes, found some great vegetarian sports nutrition connections and more. I love learning all these new things! While I’m still in my 40’s I know I’m not getting any younger! The more the years are blessed on me the more grateful I am for what I’ve had and what I still could do if I just choose to do so. I lost my Dad less than a year ago. It’s all got me thinking how important it is to embrace life and all the gifts in it; to do your best with what you have now, and to keep a positive outlook. 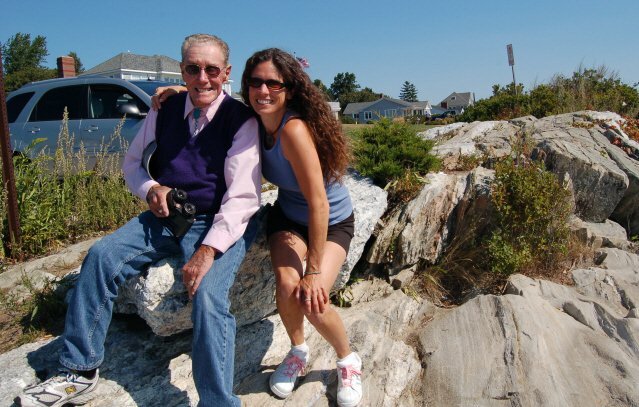 THIS is one of the biggest reasons I’ve decided to take on this triathlon challenge, and I do this in honor of my Dad! So here goes the learning, the challenge, the courage and the fun. This is going to be awesome.